Students marching in Chile on Nov. 20, 2011. SANTIAGO, Chile — Geography student and young communist Camilla Vallejo needed only to tweet to marshal thousands of her 320,000 followers, with kitchenware in hand, to the streets in protest of the steep costs of education. “After 5 months we mobilized, more of the same and continued repression more brutal than ever. Bang pots today at 20.30 hrs!,” the 23-year-old tweeted in early October following a large confrontation with police. Now nearly two months later, Vallejo, the public face of Chile’s student movement, still marches one Converse sneaker-clad foot in front of the other alongside hundreds of thousands of students almost every week. The masses are fed up with Chile’s highly privatized school system. The marches, which usually end with violent clashes with riot police wielding tear gas, are only a slice of their effort. Students have also ditched class for six months, jammed their now-rusting desks and chairs through school fences, and dragged their sleeping bags inside to fort up in empty classrooms. They staged a flash-mob rendition of “Thriller” by Michael Jackson at President Sebastian Piñera’s front door in a performance that went viral on YouTube within Chile. Keeping their eyes peeled and Twitter feeds open for inspiration and support from protests abroad, they’ve publicized their effort with a bilingual social-media campaign to muster global support. Like in the Occupy Wall Street movement, the protestors’ arsenal of tech-savvy networking strategies morphs at a dizzying pace. In the United States, OWS added an inventive blog indicating useful hand gestures to whip out during protests, but unlike with the students in Chile, many still criticize OWS for failing to converge on a specific objective. The root of their outrage — high unemployment, economic unfairness and income inequity — is easier to pinpoint than concrete demands. 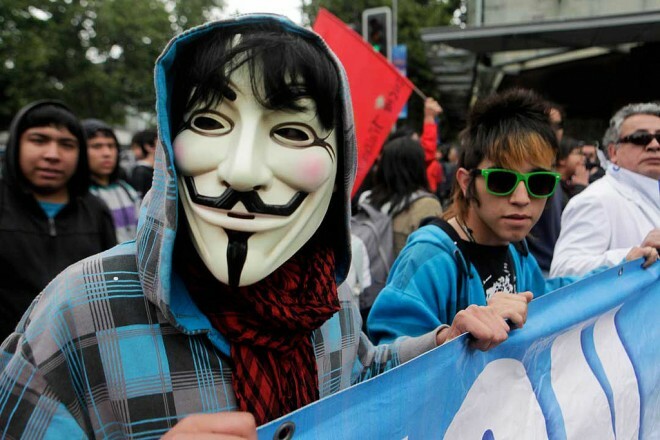 The OWS movement draws on a collective yawn in Chile, like in most countries in Latin America. The students focus their energy on targeting their message and inviting the international media to sit at their online lunch table. They recently hatched all-English Twitter account @Mobilized2011 to tell the media their side of the story sans editorial filter. The fact is that the government covers tuition for the poorest 40 percent of high school students in Chile’s current system. In addition, they shell out 15 percent of the funding for higher education, a shriveled percentage of developed nations’ average coverage of 69 percent, according to the Organisation for Economic Co-operation and Development (OECD). Fewer than half of high school students attend completely free public schools. The students dream of a state-run education system where taxpayers foot the bill instead of having their moms and dads trying to pay high tuition costs. The average cost for primary education hovers around $400 per child each year. While that might not seem like much to Americans, Chile’s minimum wage comes to only $363 dollars a month. Isaac Garardo, 19, studies history at the University of Alberto Hurtado in Santiago and moonlights as an English tweeter for @Mobilized2011. “We believe it’s essential that the world knows our fight isn’t scattered or impulsive. It is for a basic right, the right for an education. We want to clarify to the world what’s going on in our country, not just the government’s side that tries to criminalize our fight,” he said. According to Gerardo, the students’ foot tapping gave way to fist-pumping protests as they waited for the government’s answer. “The media doesn’t always cover everything that happens, so we’ve made Twitter into our media where we can tell everyone what’s going on without the censorship that occurs in traditional media,” Gerado added. Through the Mobilized2011 blog, they broadcast the smiling, dancing and sign-hoisting side of the protests: a stark contrast to the Molotov-bomb-pitching photos seen in the papers. They plaster the images into galleries and tweet the photos to international media. Their popularity has stuck center-right President Piñera between a rock and a hard place. He gave a little by offering to slash the interest on student loans and raise government spending on education by 7 percent. Piñera said making Chile’s top 25 public universities free –- one of the students’ main demands — remains outside the realm of economic possibility. The students fired back that Chile should nationalize the copper industry to fund their future. When student leaders meet with Piñera, they tweet updates and their reactions in real time, publishing their perspective before they’ve even exchanged a stiff handshake goodbye. The tweets typically read that his proposals only fidget with a system that’s begging for an invasive makeover. About 67 percent of Chile stands behind the students as of last month, down 12 percent since September, according to Adimark, a public-opinion research group. The group cited a general sense of weariness as the protests continue. Still, a large swath of the population, from teachers, doctors, mothers, miners to musicians, often skip work on Wednesdays or Thursdays to swell numbers at the student protests. Chile’s largest workers’ confederation and the National Teachers Union officially back the students. Vallejo’s reputation as a media darling remains untouched thanks to her ability to debate head to head with the nation’s political leaders — combined with her photogenic appearance, including a tiny silver nose ring that asserts her nonconformity. Their momentum is knocking down Piñera’s approval ratings. His ratings plummeted from 65 percent after the 2010 mining disaster to about 31 percent last month. Chileans said that education tops their list of concerns. Meanwhile, the students are inventing fresh ways to keep the public’s attention and even pushing beyond the social-networking boundaries established by other global protests. The Greeks may have pioneered the organize-your-protest-via-Facebook trend that has become a staple in 2011, but Chileans sharpened the revolutionary tools of social media. About a month ago, embattled students busted into the Senate building with Twitcam apps fired up. They occupied the building for eight hours until the Senators agreed to put education issues up for a plebiscite national vote. But, the controversial act reminded some of a lingering bad taste left from the last time the Senate was occupied — just before Augusto Pinochet’s dictatorship in 1973. In Greece, the protesters direct their online messages at each other or to a general corporate “enemy.” They’re reaching deep to pay for steeper taxes, coping with pension and wage cuts in the public sector, and facing layoffs from a bailout that corsets the already frail economy state. But they don’t sound off to the media under a unified voice. Twitter mainly functions as a canvas for protesters to tally up their frustration and direct the time and place to meet for increasingly violent protests. In Chile, rather than letting international newspapers rely on a scattering of freelancers or relying on local TV footage broadcast their effort, protesters live-streamed the Senate “takeover” via Twitcasting and posted the videos to YouTube. Gerardo said they aim to show the world more than a recycled montage of three-second clips. He added that they’re sharply aware of their public image and have learned a thing or two from protests abroad, such as the power of international pressure. In Libya earlier this year, where organizing protests mostly consists of the run-and-tell-your-neighbor-what’s-up strategy, second-hand pictures and videos on Twitter lassoed critical international attention and subsequent aid. Fallen dictator Muammar Gaddafi yanked Libya’s online plug during the last few months of his reign, but Libyans and expats still managed to text bloody pictures of government repression and emailed cellphone videos of troops spraying bullets at civilians. The recipients plastered the media across social networks, which were re-tweeted around the world and broadcast internationally. They stepped over the state-controlled media to send information outside of Libya. 17-year-old Lia Godoy, the secretary of Chile’s student movement’s high school organization, said that the students’ brand of social networking in Chile also cuts out the middleman and helps the students steer the conversation at home and abroad. Godoy “follows” the big hitters of the student movement. She shelved her drawing and dancing hobbies to answer their tweets to action. Godoy trekked 1,300 miles from the northern Chilean desert city of Arica to stomp through the streets of Santiago. “Sometimes, we consider the international media more objective than our own press in covering the student movement. We usually prefer to get information directly from students’ and citizens’ Twitter and Facebook accounts,” she said. Twitter offers an effective platform, considering the average Chilean devours 8.7 hours of social networking a month compared to the 5.4-hour worldwide average, according to a comScore survey. Enzo Abbagliati, director of citizen political action group El Quinto Poder, says citizen media is here to stay in Chile. Thousands of students, sleeping behind barricaded school doors, learned to use social media as “a fundamental vehicle to effectively break the monopoly of medias,” according to Abbagliati. The scale, execution and source of frustration behind each of the 2011 global protests are distinct. But the frustration over the political economy, inequality and the current model of global capitalism that left many scouring for a model that wires them together. In Chile and around the world, the protests promise — or threaten — to continue as a trending topic. Despite facing university orders to get back to class, a government threatening to criminalize their actions, and waning public favor, the students aren’t backing down. Last week, thousands staged another protest in Santiago and live TwitCasted as water cannons sprayed them down to ensure that the world doesn’t miss a drop. Katie Manning reports for Mi Voz, which publishes 15-online newspapers focused on citizen journalism across the regions of Chile.